Extreme Focus, Energy, Clarity & Fat Loss! 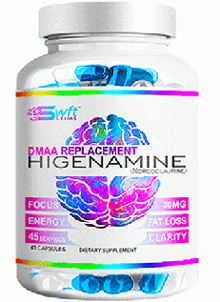 Higenamine Has Extreme Fat-Burning Properties As Well As Being A Potent Stimulant For Pre-Workouts And Other Focus Heavy Activities! Higenamine HCl (aka Norcoclaurine) is a member of the Nandina plant family. Traditionally Higenamine has been used as an anti-asthmatic due to its affinity for B2 adrenergic receptors but has since been repurposed by the fitness community as a potent energy source and fat burner. This B2 agonism makes it a suitable fat burner and a powerful stimulant. Every batch of SWFT Stims is lab tested and manufactured in a FDA registered, GMP manufacturing facility. SWFT Stims, quality you can trust.